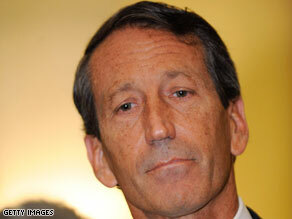 Mark Sanford, a Republican, has refused to resign in the face of criticism from his own party. (CNN) - A resolution of impeachment against Gov. Mark Sanford is likely to be introduced next week during a special session of the South Carolina legislature, but lawmakers said the governor's job is safe for the time being. Republican state Rep. Greg Delleney told CNN his resolution lists three charges against Sanford: dereliction of duty for leaving the state to visit his mistress in Argentina in June; attempting to cover-up the scandal; and bringing "disgrace and shame and ridicule" on the state. "If that is not serious misconduct in office, I don't know what is," Delleney said of Sanford's actions. The one-day special session was not called to address the Sanford scandal, a point stressed by GOP leadership in both chambers. Instead, lawmakers are meeting to tweak a state law that will extend unemployment benefits for thousands of South Carolinians who began losing those payments over the weekend. The state has an unemployment rate of 11.5 percent. But most Republicans in the legislature want the governor to resign and several are ready to begin the impeachment process, even as the results of a state Ethics Commission investigation into the governor's travel expenses are still pending. Delleney said his goal is "to get the ball rolling" on impeachment in a committee before the legislative session officially begins in January, when he hopes the resolution can be quickly brought to the floor for a vote. Podcast: Is Afghanistan becoming Obama's Vietnam? In the latest installment of CNN=Politics Daily: A new CNN/Opinion Research Corporation poll shows that Americans are beginning to compare the U.S. military operation in Afghanistan to the Vietnam war. CNN White House Correspondent Dan Lothian reports on the tough choices that lie ahead for President Obama on Afghanistan. Meanwhile: The White House is taking aim at lobbying efforts by Wall Street. CNN National Poltical Correspondent Jessica Yellin reports. Plus: During his White House bid, President Obama promised that when it came to health care reform the American people would not be kept in the dark. With five health care bills now out of various congressional committees, some critics are asking where is the transparency that Obama promised. CNN's Jim Acosta has the story. Finally: From tracking missing children, investigating fraud, and assuring the first family's safety, the Secret Service has its hands full. CNN's Brian Todd takes a look at a new congressional report that raises concerns about whether the elite force responsible for protecting the president may be overloaded with too many responsibilities. WASHINGTON (CNN) – The U.S. Chamber of Commerce says it will ask law enforcement officials to investigate a fake press release and fake press conference staged at the National Press Club. The business advocacy group was apparently the victim of a complex hoax Monday that involved fake press releases claiming the Chamber had changed its position on climate change legislation, and would now support cap-and-trade legislation introduced by Democrats in the Senate. The hoax also included a fake press conference in Washington that was reportedly interrupted by a real representative of the Chamber of Commerce. "We will be asking law enforcement authorities to investigate this event," Thomas J. Collamore, the Chamber's Senior Vice President for Communications and Strategy said in a statement posted on the advocacy group's Web site Monday. "Public relations hoaxes undermine the genuine effort to find solutions on the challenge of climate change." In a blog post on its Web site Monday, liberal activist group The Yes Men appeared to take credit for the hoax. The blog post includes a link to a fake set of remarks attributed to a Chamber official on the issue of climate change, as well as video of Monday's confrontation at the National Press Club. 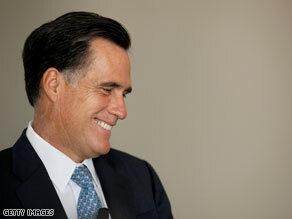 Romney spoke at an AIPAC summit in California on Monday. WASHINGTON (CNN) - Mitt Romney has a message for the Obama administration: Stop talking to Iran. Period. "The Iranian leadership is the greatest immediate threat to the world since the fall of the Soviet Union, and before that, Nazi Germany," Romney said in a speech Monday to the pro-Israel group AIPAC at their national summit in San Diego, according to excerpts provided to CNN. "The Iranian regime is unalloyed evil, run by people who are at once ruthless and fanatical," Romney said. "Stop thinking that a charm offensive will talk the Iranians out of their pursuit of nuclear weapons. It will not. And agreements, unenforceable and unverifiable, will have no greater impact here than they did in North Korea. Once an outstretched hand is met with a clenched fist, it becomes a symbol of weakness and impotence." Romney - who has used a series of high-profile speeches to bolster his foreign policy profile in advance of a possible 2012 presidential bid - called on the United States to enact "comprehensive, withering sanctions" coupled with support for "the forces of freedom within Iran." He demanded that a "credible" military threat must remain on the table if Iranian leadership insists on threatening Israel with annihilation. 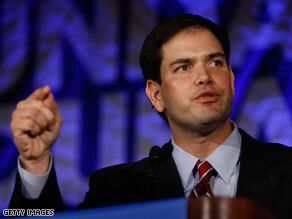 Marco Rubio has snagged the endorsement of Oklahoma Sen. James Inhofe. WASHINGTON (CNN) - Another out-of-state conservative is weighing in on the Florida Republican Senate primary, and this time Marco Rubio is the beneficiary. The former Florida House Speaker has snagged the endorsement of Oklahoma Sen. James Inhofe, who said in a statement Monday that Rubio "will stand up for America's taxpayers, not with President Obama and dangerous big government spending." Inhofe's remark is a jab at Rubio's opponent, Gov. Charlie Crist, the better-funded frontrunner for the Senate nomination. Crist has the backing of national Republicans, but has drawn the ire of conservative activists for his support for President Obama's stimulus package. The Oklahoma senator has earned a reputation as one of the country's leading skeptics of global warming, and has called the theory "a hoax." Rubio doesn't agree. Asked to comment on Inhofe's crusade against global warming, a Rubio spokesman pointed to a May interview with The American Spectator in which the Senate hopeful said he does not challenge the claims of global warming. Inhofe is the second GOP senator to endorse Rubio after South Carolina's Jim DeMint did so over the summer. WASHINGTON (CNNMoney.com) - Senate leaders on Monday unveiled their proposal to tackle overdraft fees, the penalties banks charge customers who spend more than they have in their accounts. Echoing legislation offered in the House by Rep. Carolyn Maloney, D-N.Y., the Senate bill would require banks to ask customers before enrolling them in overdraft programs. In addition, like the House bill, it would limit the number of overdraft fees charged in a year. Currently more than 75% of banks automatically sign customers up for overdraft programs, according to a study by the Federal Deposit Insurance Corp.
"At a time when many can afford it least, American consumers are being hit with hundreds of dollars in penalties for overdrawing on their account by just a few dollars," said Sen. Chris Dodd, D-Conn., chairman of the Banking Committee. "Banks should not be trying to bolster their profits at the expense of their customers." But the Senate's bill goes further than the House bill in several areas. 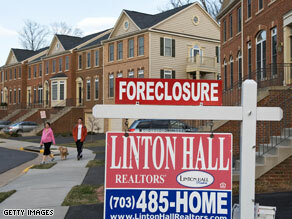 Yet another housing bailout on the way. NEW YORK (CNNMoney.com) - Just as federal officials seek to wind down many bailout programs, the Obama administration announced Monday yet another initiative to prop up the housing market. Administration officials unveiled a plan to aid state and local housing finance agencies, which provide mortgages to first-time and lower-income homebuyers and enable the development or rehabilitation of rental properties. Officials declined to put a pricetag on the program, but said there would be no cost to taxpayers. "This initiative is critical to helping working families maintain access to affordable rental housing and homeownership in tough economic times," said Treasury Secretary Tim Geithner. Under the initiative, the Treasury Department, along with Fannie Mae (FNM, Fortune 500) and Freddie Mac (FRE, Fortune 500), will purchase housing bonds issued by the finance agencies. This will give the groups the funding needed to make new loans. Also, the government will provide a temporary credit program to allow the agencies to refinance their existing bonds to more favorable terms. WASHINGTON (CNN) - Congressional Democrats won the money war in September. The Democratic Congressional Campaign Committee announced Monday that it doubled its Republican counterpart in fundraising last month, bringing in $7.05 million to bring its total to $14.7 million in the bank. The National Republican Campaign Committee brought in $3.4 million in September and now has $4.3 million cash on hand. This is the fourth straight month that House Republicans have topped $3 million, which spokesman Paul Lindsay called one of the "encouraging signs." "Our continued and steady improvement in grassroots fundraising is just one of the many encouraging signs that the policies of a Democrat-run Washington are mobilizing Americans to take action and support our efforts," Lindsay said in a statement. Senate Democrats had similar success last month. Last week, they announced they had outraised the National Republican Senatorial Committee $5.9 million to $3.2 million in September. 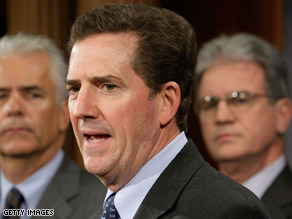 DeMint is running for a second term in 2010. WASHINGTON (CNN) - South Carolina Sen. Jim DeMint's sharp attacks on President Obama - including his memorable line that conservatives can "break" the president by blocking health care reform - have put him in the Democratic crosshairs. Now national Democrats think they've found the candidate with the best shot at unseating the first term Republican: Chad McGowan, a 38-year-old trial lawyer from conservative York County who officially announced his candidacy on Monday. Said one Democratic leadership aide in Washington: "Is DeMint more vulnerable than [Richard] Burr or David [Vitter]? Probably not. But McGowan is a self-funder and from the right part of the state. He could give a Republican a run for his money." McGowan said in an interview with CNN that South Carolina "can do better" than DeMint, but he refrained from any outright attacks against the Republican on the day he jumped in the race. "I don't want to get into bashing any sitting senators at this point," he said. "These races are marathons. I'll just try to keep it positive for now." DeMint has nearly $3 million in the bank for his campaign, not to mention a loyal network of conservative activists in South Carolina and nationwide willing to support him. McGowan wouldn't say if he plans to contribute his own money to pay for the campaign, but promised to raise "whatever it takes" to win. The last competitive statewide campaign in South Carolina - the 2002 governor's race between Mark Sanford and Jim Hodges - cost more than $12 million. The group, which is backing third-party candidate Doug Hoffman, calls Republican Dede Scozzafava and Democrat Bill Owens 'two liberals'. WASHINGTON (CNN) -The conservative Club for Growth is spending another $300,000 on a new ad attacking the Democratic and Republican candidates in the race to fill the congressional seat vacated by New York Rep. John Hughes. The group, which is backing third-party candidate Doug Hoffman, calls Republican Dede Scozzafava and Democrat Bill Owens "two liberals" in a new television spot set to hit airwaves in parts of New York's 23rd district on Tuesday. "Tired of choosing between two liberals for Congress?" 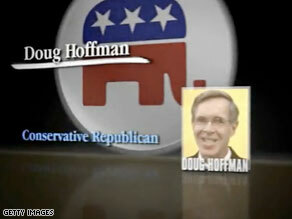 a narrator asks in the ad, before calling Hoffman a "conservative Republican" and the "common sense choice." The group has now spent more than half a million dollars in less than a month on ads that attack both Scozzafava and Owens. The special election to fill McHugh's seat will be held November 3.